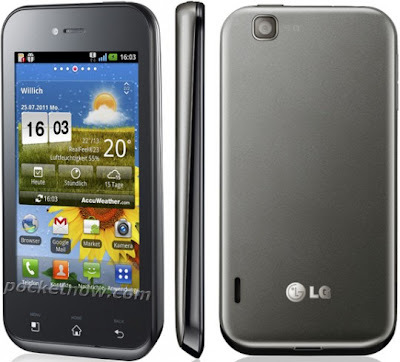 The LG Optimus Sol is a new release by LG under its series of Android smartphones in India. The smartphone has a 3.8-inch Ultra AMOLED display, 1GHz processor, 5 megapixel camera with 720p HD video recording and Android 2.3 Gingerbread operation system. LG Optimus Sol is 9.8mm thick and is very light in weight to carry on. The device in all black design has a very fine built quality. The earpiece on the phone is at its front side on the top. Close to earpiece are located camera lens and proximity sensors. After that comes the number of 3.8-inch ultra Amolded display. The display is supported by three capacitive keys which are located about gap of half inch from display. The keys are backlit. On the left side of the phone are situated volume control keys. Other utilities at the top of the phone are power key, headphone jack and the micro USB port under a plastic flap. Back side of the phone has a large battery cover that covers the entire backside of the phone. The cover is developed from glossy plastic. Display, which has a 3.8-inch, WVGA (800 x 480) resolution, Ultra AMOLED display uses RGBG PenTile-matrix layout for the sub pixels like the Super AMOLED displays on Samsung's phones. The Optimus Sol is powered with 1 GHz Qualcomm Snapdragon MSM8255 processor and 512MB of RAM. For working the device has Android 2.3.4 with LG's custom skin on top. In apps there are many add-ons. There about seven homescreens on the Optimus Sol can be generated. The Optimus Sol with 5 megapixel camera is suitable for auto-focus and flash. The phone does not have a camera shutter button. The image quality of the camera is average. The video recording is not more than casual recording. The phone has a 1,500mAh rechargeable battery which is user replaceable that lasts for a day after regular use. The Optimus Sol costs Rs. 16,990 in India.